A digital photo frame that merely displays pictures? We scoff. Any old photo frame can do that. But we have loftier standards, so this is our idea of the perfect digital photo frame, which draws on some of the best parts of the many frames on the market today and puts them all together into one price-knows-no-bounds device. Did we miss something? Tell us what you think ought to be included. Image rendered for PC World by Brian Christie Design (click through for larger image). 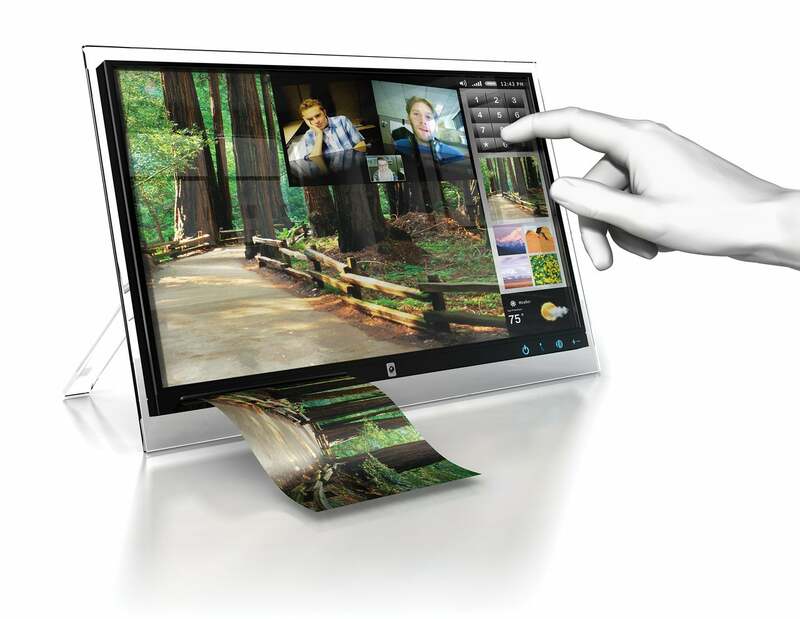 Touch-enabled displays and high-contrast OLED panels are two emerging trends for digital photo frames. Recently Kodak was first with the latter, but our 10.5-inch dream device uses both. In our case, touch permits intuitive navigation of image, video, and music files, as well as of VoIP services, widgets, RSS, and the Web. Built-in 802.11n Wi-Fi to stream multimedia via networked PCs or the Web. Optional: 3G data or femtocell signal boosting. Some real-world digital photo frames--SmartPart's SP8PRT (sold in the U.S.) and Keian's P71-A2-JP (Japan only)--can print. We'd print 4-by-6-inch photos using a similar dye-sub method, or maybe employ Zink's zero-ink technology, as Polaroid did for its portable Pogo printer. An integrated tilt-adjustable camera and microphone for multiparty VoIP video calls, Web conferencing, intercom use, and quick, happy snaps. The camera and frame can also work for basic video surveillance. A touch-sensitive shortcut strip features Blue LED-backlit icons to switch power on or off, to access VoIP-phone and Web screens easily, or to adjust the volume. What we took: Sleek design, touch screen, three-way VoIP video/voice phone, Web features. What we took: Google Android OS, multitouch screen, VoIP video/voice phone, Web widgets. What we took: Femtocell cellphone signal boosting, touch screen, VoIP phone features. What we took: Built-in 4-by-6-inch dye-sublimation printer, multiformat card reader.